Last entrance 30 minutes before the closing time. The permanent exhibition in the basement of the Petřín Observation Tower helps visitors visualize how Petřín Hill has changed over the past centuries. The lively building and social bustle on Petřín Hill at the end of the 19th century is described in the exhibition section dedicated to the original concept of the observation tower, the circumstances leading to its construction, the manner of its construction, and the key role of the Czech Tourist Club whose members capitalized on the atmosphere and possibilities of the time, and inspired by modern Paris, implemented the bold idea of the extensive transformation of Petřín Hill. Lift for the handicapped and elderly people to the top, wheelchair access to the viewing gallery at a height of 20 m only. 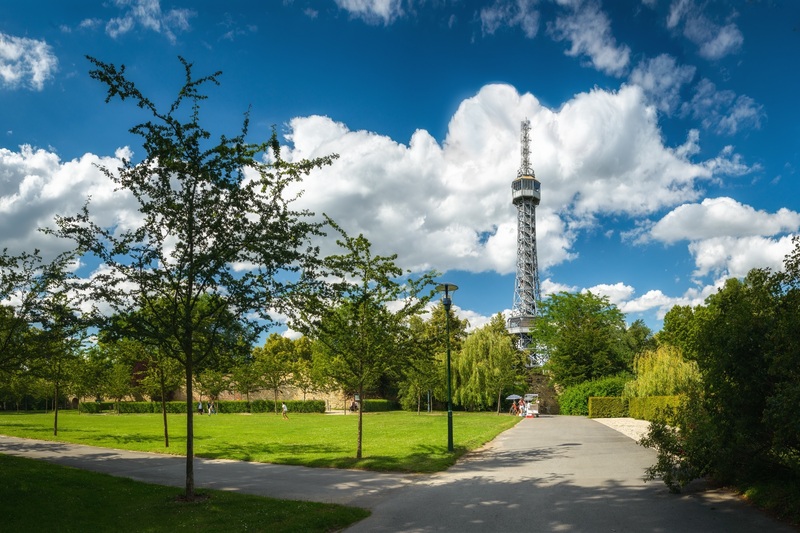 In 1889, members of the Czech Tourist Club visited the world exhibition in Paris, where they were so impressed by the view of the famous Eiffel Tower, that they decided to create a similar dominant above the city of Prague. They founded a Society for building the View Tower, invested the first money, and got a land plot from the magistrate. 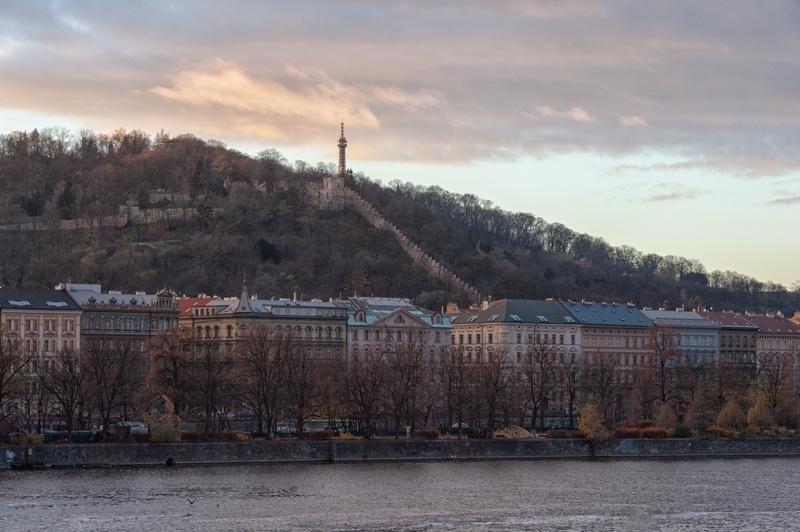 It was decided that a five-time smaller imitation of the Eiffel Tower would be built on the Petřín hill, 318 m above the sea level. 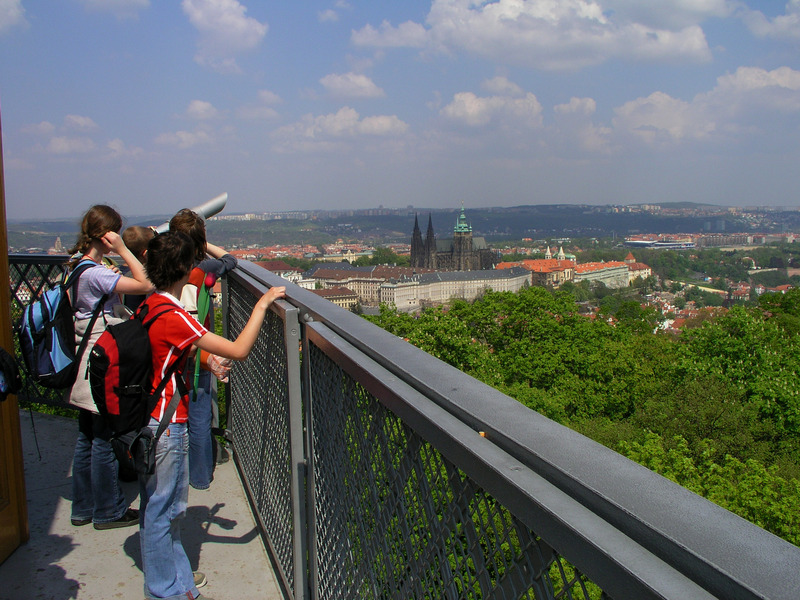 The building of the View Tower was speeded up by the organization of the Prague municipal jubilee exhibition in 1891. The project was prepared in 1890 and the necessary funds were acquired. The construction started in March 1891 according to the design of arch. Vratislav Pasovský, the authors of the construction were ing. František Prášil and ing. Julius Souček from the Českomoravská strojírna (Czech-Moravian machine plant). The entire construction grew up incredibly fast, it was approved on the 28th July 1891, and the View Tower was festively open on the 20th August 1891. It is made up of a light octagonal lattice steel construction on which 175 tons of iron was used. The eight arms of the construction were anchored in mighty rock blocks in the apexes of the octagon, the diagonal of which is 20 m long. There are 299 steps all the way up to the observation cabin, which is 51 m high and offers a beautiful view of the city. The overall height of the View Tower is stated at 63.5 m.
Twenty metres high into the first floor, a covered observation terrace was built with a gallery. Originally, the roof, which is 60 m high, was furnished with a stylized crown with a flagstaff. Back then, the visitors were taken to the observation point by an elevator with a capacity of 6 persons, first powered by gas, then by electricity. The ground-floor pavilion was used as a restaurant. On the 5th July 1938, at the time of the Sokol festival in Prague, there probably was a short circuit and fire broke out in the elevator cabin. The visitors left the cabin in time and got safely down to the ground floor, yet the upper part of the View Tower was damaged and had to be partially re-built. On the 1st May 1953, a television transmitter has been put into operation on the View Tower. At that time, the elevator was abolished in order to have the tube filled by cables and feeders. The cabin on the first floor also started to be used by the telecommunications, to which the entire tower was transferred. Instead of the royal crown, a television antenna was installed at the top, and later the antenna extension of the tube. The visitors were left with both the staircases and the top observation cabin. A platform was built above the first floor for dish antennas. In 1980, the View Tower was closed for public due to emergency condition of the tube and the staircase. In 1991, the General Czechoslovak exhibition was held to commemorate the 100th anniversary of the Municipal jubilee exhibition. On that occasion, the tower went through the most important necessary repairs and was open for public. Since 1998 till 2012 it had been within the administration of the Prague Information Service. The View Tower’s general reconstruction started in 1999 and lasted for two years, mostly in the operating conditions. 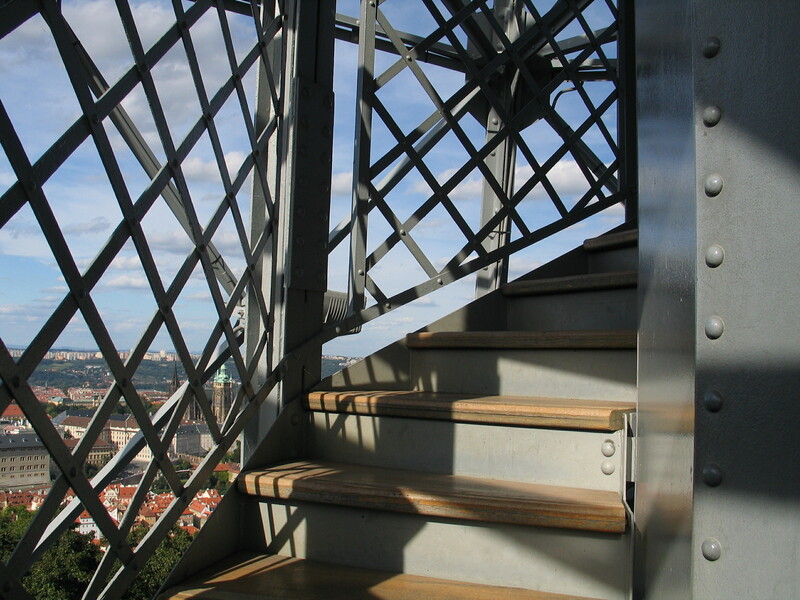 The watchtower View Tower’s reconstruction was carried out by Spojprojekt Praha a.s. The old staircases were taken down, and both were made anew from high quality wood without knags. The stairs were furnished with non-skid surface. A new tube was set in, with an elevator for the disabled and for seniors, which goes up to the top observation cabin. Instead of the former sheathed balcony, an elegant gallery was built at 20 m, furnished with field glasses. This gallery is accessible for tourists in wheelchairs, too. The basement area is kept open, and the pillars on which the View Tower is standing are visible there. The watchtower was open for public after the reconstruction on the 24th March 2002.